The Doctor and Charley travel to the remote Cimmerian System to unravel the mystery of its sun. But darkness has already embraced the scientific base on Cimmeria IV in more ways than one. 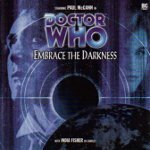 In a fight for survival, the Doctor must use all his wits against a deadly artificial life-form and an ancient race whose return to the Cimmerian System threatens suffering and death on an apocalyptic scale.